Hotel Himalaya Castle is a heritage turned 3 star deluxe hotel in Mussoorie providing a perfect heritage holiday in between the hills. The hotel offers a homely environment in its spacious and tastefully decorated rooms having all modern amenities and facilities. Situated at the commanding location near the Picture Palace at the end of Mall Road, this hotels have ample parking space and balconies offering scenic Doon valley views. 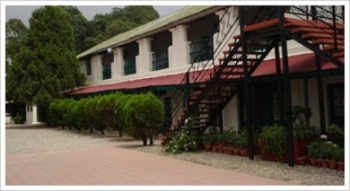 The hotel has an in house restaurant and good accessibility to all tourist spots in Mussoorie . Hotel Himalaya Castle is located near the city board in Kulri, Mussoorie. Famous Mall Road is at 2 min walking from the hotel. Nearest railway station is at 32 kms in Dehradun and the Jolly Grant Airport is at 50 kms away from Himalaya Castle. Hotel Himalaya Castle provides 28 spacious, well furnished, neat and clean rooms having 4 beds in each room. All rooms have attached bathroom, telephone with STD facility, Satellite TV and 24 hr hot & cold water. The hotel provides Deluxe and Super Deluxe type of rooms which has 4 bed in each room. The hotel has a multi cuisine in house restaurant serving wide variety of dishes like Indian, Chinese and Continental. Guests can enjoy the food in an open space watching Mussoorie city and surrounding hills.